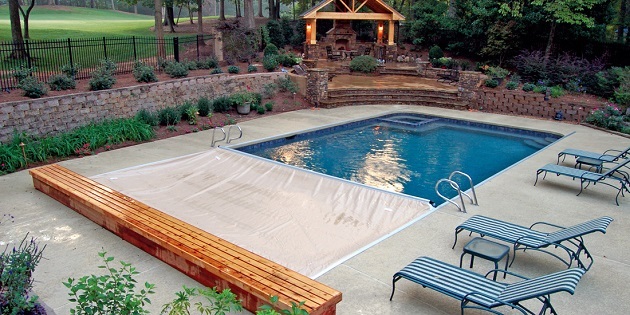 If you are one of the lucky people who own a pool, then you have probably heard about pool covers. They are a necessity that keeps your pool clean and maintains the optimal temperature and you can find pool covers Australia wide. They are basically like a blanket for your pool and while they do help keep debris out, their main goal is to keep the temperature warm. You may have seen them in stores, they almost look like giant pieces of bubble wrap and they come in many different varieties. The most popular choice in pool cover seems to be the solar pool cover and below we will go over some of the benefits, how to use it, and anything else you need to know. So how do these solar pool covers actually work? Well, it’s a simple concept. It basically traps the heat from the sun and keeps the water warm. We all know when the sun is out it heats up your water, but once night fall comes, the heat escapes leaving the water cool. With a pool cover this doesn’t happen the cover traps the heat. This is great for those late summer nights when you feel like going for a dip as the water will have just the right temperature. It’s also important for you to know how and when you should be using a solar pool cover. You should always place the solar pool cover with the bubbles facing down. This is to make sure that the bubbles of air are trapped in the water which is how the pool cover actually floats. You should also make sure that the cover isn’t coming up over the side of the pool or all over the deck. You should carefully cut off the excess if the cover you have chosen is too big, you want it to fit the pool in the right way. The best time to use the pool cover is of course when no one is using it. You can easily just put it on at night to trap the heat. It sounds a little strange but it will undoubtedly keep that warmth that was collected during the day. Some of the benefits you can get from using a solar pool cover include keeping the warm water in so you don’t need to invest in a pricey self heating system. You also save time cleaning and won’t have to worry about clogged drains. Having a solar pool cover is a great way to also keep in flying debris or bugs out of the water. Another benefit most people don’t realize is that they are really lightweight and easy to use so they are a great step in easy maintenance when it comes to your swimming pool. If you are one of those lucky Aussies who has a pool in summer then you should consider investing in a pool cover. This will give you warm water whenever you want it and keep you from spending half your time cleaning it. You will be ready to jump into the water whenever you want and not have to worry about it being too cold. You can also easily find pool covers Australia wide in stores and online. This is great because now you can buy all the pool accessories you need from the comfort of your own home.